Various 3D printing technologies have been developed that can print in very rigid metal alloys, but those systems are rather expensive. Most of us are more familiar with plastic filament as a printing medium because it’s easy to work with and relatively inexpensive, but it can be a tad brittle, especially on complex pieces. The difference in strength between the metal prints and the plastic prints isn’t entirely dependent on the material though; the way they’re created is also a factor. While some expensive commercial systems utilize proprietary techniques of maximizing structural integrity, not all do, and personal printer software certainly doesn’t. Bedrich Benes, a computer graphics associate professor at Purdue University, was especially troubled by this problem, so he’s worked on a solution with Adobe’s Advanced Technology Labs’ senior research manager, Radomir Mech, who can relate to Bedrich’s woes, having had models delivered in more pieces than they were shipped. Not every modeler is an engineer, and often models are designed visually; if it looks correct after being printed, then job well done. Since inanimate objects don’t feel peer pressure, there’s no force applied to a printed object by simply looking at it, but that’s not the human way: to simply look. No, we will touch, handle, poke, toss, rub, and drop it. Some say it’s a toddler thing, I think it’s a human thing. Regardless, printed models need to be prepared for the harsh truths of reality, like gravity and friction and how nasty their combination can be. This project adds some reality to the digital modeling world by applying the physics of human fondling. The software, developed by former Purdue doctoral student Ondrej Stava, analyzes a model, finds the weak spots, and then applies one (or a combination) of three methods of increasing structural integrity: adding more layers to key structural points, adding struts, or hollowing heavy or overhanging areas. The hollowing feature can lower cost and weight of a print by up to 80%, and the software also estimates how the object will be gripped and held. 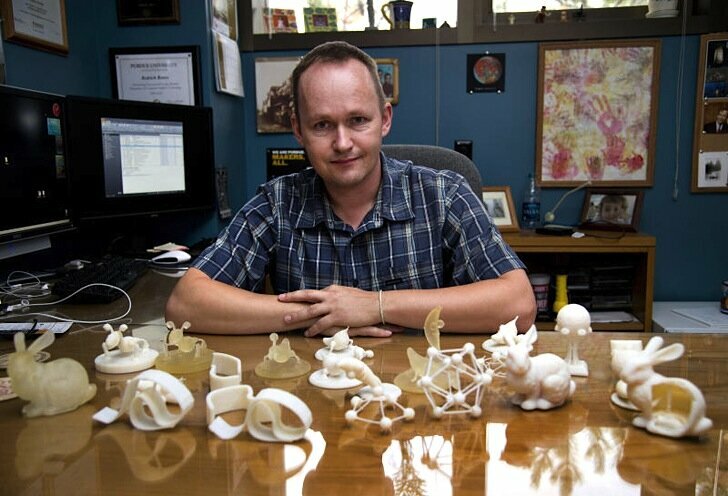 This program and others like it in the future will aid to increase the efficiency and useability of 3D printing. Eventually modeling software will have more engineering fundamentals built in so that you’ll know your object is structurally sound before printing. I imagine the operations of mechanical models could even have structural presets such ‘reduced weight’ or ‘long life.’ I appreciate that 3D printing is getting the necessary attention to accelerate its rise of practicality; these printed things are not merely aesthetic. Printing objects for the real world is only sensible if we actually want to use them. I know I do.